Innovations in electronic field always give wonder to those people who love latest technology and products. Here is a good news for them that LG, one of the leader in electronic products announced it has begun mass production of a six-inch, 1024 x 768 e-paper screen that can bend by up to 40 degrees. The experts in this field are saying this will definitely make a revolution in e-book market. LG also claims that the display is super durable, as evidenced by a series of successful drop tests from a height of 1.5 meters. 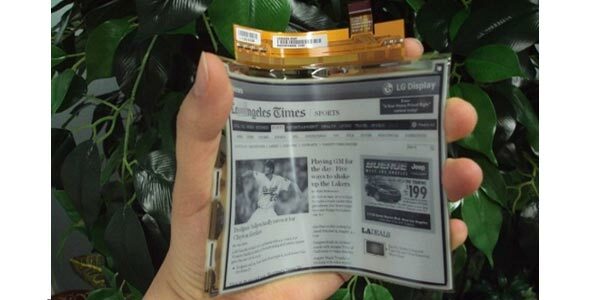 But we didn’t find any official press release related with LG’s Flexible Plastic E-Paper Display launching but many trusted national and international publications are reporting that the plastic-based screen is shipping to Chinese manufacturers for mass production. It is expected that the device will available in Europe as soon as early April. Did you think will Samsung launch competitive product in April? Let us wait and see.